I am always searching the internet for positive and creative things. I found this a little while ago. It caught my eye because of the circle diagram. We all remember those right? This diagram and quote speaks to me because I believe that making a difference is more important then making a living but you do have to make a living and work in this world. It shows that you can make a difference in this world and make a living and somewhere in the middle of all that is when you find your true self. 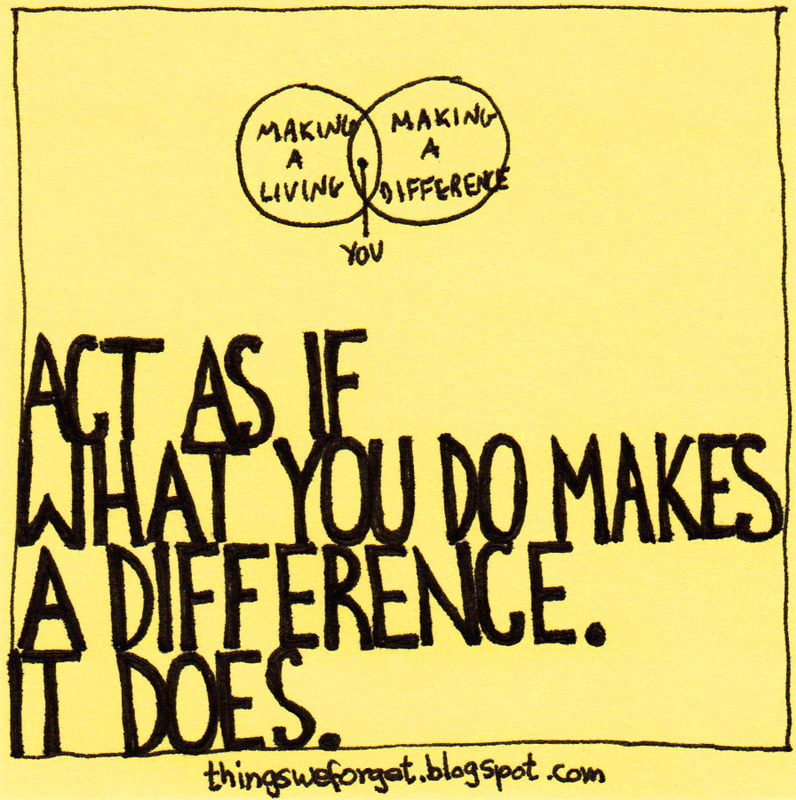 Are you making a difference, are you making a living, or are you transforming who you are to do both? UPwithMarch I will be expressing 31 days of Gratitude. I will be posting one thing I am grateful for everyday on my Facebook Page. Be sure and check it out each day and I encourage you to follow my page, share it with your friends and write what you are grateful for in the comments below each day. You don’t have to comment everyday but pick a day or days you wish to contribute by telling the world what you are grateful for. My blog posting will continue as normal but each post will also be about Gratitude. I would be most grateful for your contributions. It only takes a few seconds to write but the feeling you give yourself from sharing will last much longer! What are your passions? What do you desire most in life? Have you experienced them? Are you working towards them? How many passions do you have? Passion is important in your life. We are not robots that just eat sleep and work. Some of you may feel like robots some days but there are things you are interested in beyond the normal routine of your day. Your passions could be as simple as a good book or homemade cheese cake, but also as lavish as moving to France or reaching the top of Mount Everest. Passion is not just a thing it’s a journey, the path to things you love in life. Without passion along the way I would never be where I am today. People who have and show a lot of passion are the ones that are flourishing in happiness. Passionate people are the ones that can be positive through the toughest of challenges. Most of all Passionate people carry a love inside of them, unique to them, that they share with everyone. Fill your life with passion, Fill your path with love and be grateful for the journey. 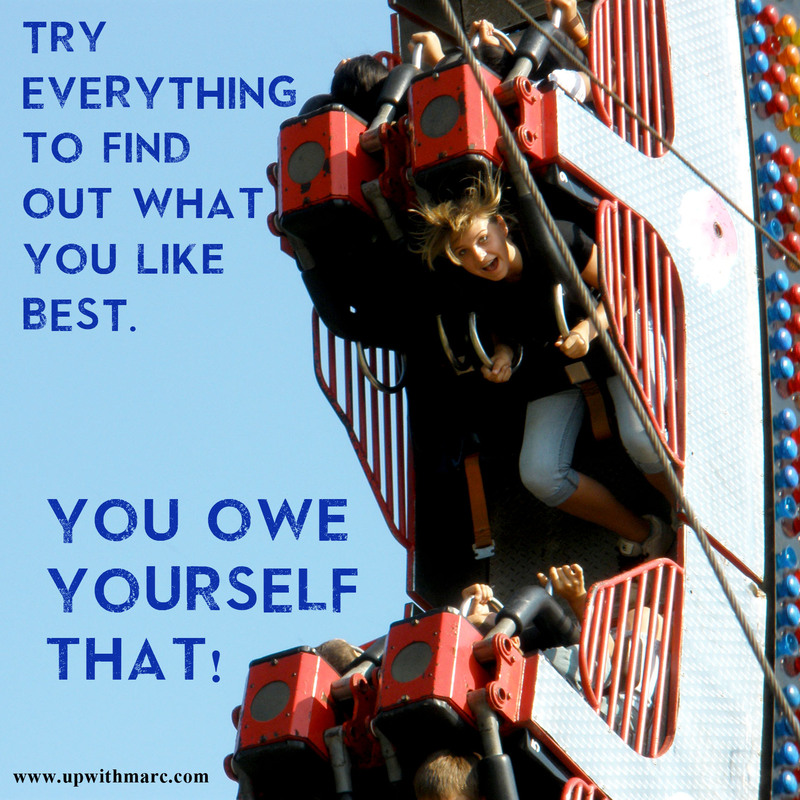 Bucket listed or not you owe it to yourself to try everything! I have decided to make March my month to share gratitude for the things I am grateful for in life. Everyday in the month of March I will be posting 1 thing I am grateful for on my Facebook page (https://www.facebook.com/UPwithmarc). I not only encouraging you to check it out each day but to also like my page and share what you are grateful for as well. I would be most grateful for you to share my blog and my Facebook page with your friends as well! I would like to fill my Facebook page with gratitude by others as well as myself. Why am I here? I reach that point of pure inspiration and I have no idea how to explain it. My life struggles are merely a matter of opinion. Plenty of others have it far better or worse than I do. I continue to rise every morning in search of the unknown. Some days I have full confidence in where I want to be in my life, other days I wonder if I am insane. I get asked again and again the purpose of my blog, the purpose of my desire to be a motivational figure, and the purpose of my new life. All people, positively curious, want a fine tuned answer of where I am going. I don’t have an answer. We set goals and work towards them all the time, but sometimes there are bigger things in life then even your goals. Sometimes you wake up in the morning and you just let life happen. Sure I want to be a motivational speaker but have I narrowed down what I want to motivate people about? NO. Right now if I did that I would be narrowing my view, narrowing my life. This is a concept I finally understand. I remain open to catch everything. I talked a few times about heartbreak, but truthfully it is that heartbreak that has lead me to who I am today. Any negative opinions of my challenges, successes, and my journey just don’t matter anymore. If you can believe it I am transforming myself little by little into the most positive person I have ever known. Sure, I make mistakes, big mistakes. You would to when you try to introduce your positivism in a negative world. The biggest thing I have thought about my whole life is how different I am from everyone, from my style all the way down to my thought process. I am nothing close to perfect but I am original. Everything I do now in life carries great purpose. When I struggle to meet goals or even find love in my life I realize that there is a higher purpose that I have only begun to discover. I am grateful I have found this journey. I am grateful you have read this and I am grateful you are part of my journey. This journey is far from the beginning and far from over. After a little over 2 weeks it is good to be back. For the month of March I will be doing 31 days of Gratitude. I will be posting one thing I am grateful for everyday on my Facebook Page. Be sure and check it out each day and I encourage you to write what you are grateful for in the comments below each day.